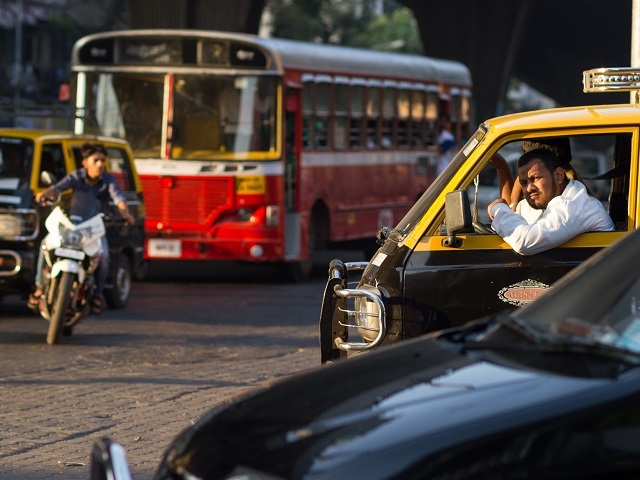 This series examines the reality and implementation bottlenecks of clean transport initiatives in India, covering areas such as emission standards, alternative fuels, and electric vehicles. According to the World Health Organization (WHO), Delhi’s air ranks among the worst in the world. Of course, the situation is not limited to the capital—the WHO ambient air quality database lists 12 other Indian cities among the world’s top 20 cities with the highest annual average particulate matter (PM) levels. India also comes in at number 155 in an environmental quality survey conducted by the World Bank across 172 countries, and is unfortunately rated last in terms of air pollution. These rankings, as disturbing as they are, have sparked much needed debate in India, particularly on transport management practices. This is crucial, since the transport sector is believed to be one of the leading sectors affecting air quality in Indian cities. Indeed, the few measures that have been proposed recently to correct Delhi’s air quality include regulating vehicular traffic based on odd-even name-plate registrations, prohibiting registration of new diesel luxury vehicles, and re-routing heavy duty commercial vehicles. While some of these initiatives offer temporary solutions, they fail to go far enough. Establishing long term air quality requires a commitment to integrating clean transport strategies that fundamentally change both fuel and technology currently in use. Emission standards for vehicles define the maximum permissible limits for pollutants such as PM and Oxides of Nitrogen (NOx) in vehicular exhaust. Compliance with such standards requires adherence from two key sets of stakeholders—refineries and automobile manufacturers. In short, refineries are required to manufacture, test, and sell fuel meeting the prescribed specifications; automobile manufacturers are required to manufacture, test, and sell vehicles with the requisite engine emission control technologies and engine compatibility. Many countries, including India and China, have benchmarked their emission standards with the European “Euro” standards—a series of progressively stringent norms. Currently, for light and heavy duty vehicles, India follows the Bharat Stage (BS) IV standards (based on Euro 4) in major cities and BS-III (based on Euro 3) in the rest of India. In global comparison, India lags behind with respect to implementation of best-in-class emission norms. For perspective, the European Union adopted Euro 6 in 2014 while China has been implementing China V (based on Euro 5) in major cities since 2013. India’s Journey—Staged Upgrade or Direct Transition to BS VI? By When? 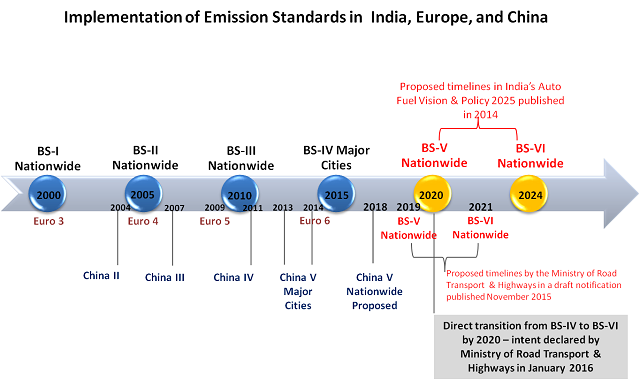 The Auto Fuel & Vision Policy 2025 of India, published in 2014, proposed rolling out nationwide BS-IV, BS-V, and BS-VI (based on Euro 4, Euro 5, and Euro 6) over a staged timeline by 2017, 2020, and 2024 respectively. However, as air pollution worsens, India has been debating between adopting this incremental upgrade to BS-VI or directly transitioning to BS-VI. In a move to bring about legislation on this matter, the government published a draft notification for staged implementation of BS-V and BS-VI by 2019 and 2021 in November 2015. It is estimated that the proposed upgrades have the potential to reduce vehicular PM and NOx emissions in the range of 40 percent – 80 percent on a step-by-step timeline. However, sector experts make a case for directly transitioning to BS-VI on grounds that “in-use” data from Europe suggests that NOx control in diesel vehicles has been below design levels with Euro 5 and Euro 6 overcomes this as a superior performing standard. Intuitively, for India to upgrade to Euro 6 equivalent norms means some conditions must be met. This includes two investments: (1) approximately INR 80,000 Crore (~USD 12 billion) on part of Indian refineries for producing cleaner burning fuel (necessary to meet the next generation emission controls); (2) INR 50,000 Crore (~USD 7.5 billion) by automobile manufacturers for producing vehicles for the Indian market with end-of-pipe controls such as diesel particulate filters and selective catalytic reduction units. The response to the push for legislation has seen heavy negotiation among key stakeholders on feasibility of timelines. Indian refineries are reluctant on making staged investments and favor upgrading directly to BS-VI fuel by 2020. The automobile industry, however, favors a staged upgrade to BS-V by 2019, but is critical on upgrading to BS-VI by 2021 on account of the Indian market scenario. They have expressed concerns that in addition to increasing vehicle costs, introducing Euro 6 equivalent controls in Indian driving conditions requires extensive testing. Ironically though, India manufactures and exports compliant vehicles for the European market. In a move that signals strong commitment to bringing about air quality improvements, the government has now announced its intent to directly adopt BS-VI standards by 2020. The decision comes amidst growing pressure to act on air pollution, and citizens now await a finalization of the move. While the transition will be complex and expensive, implementing best-in-class emission standards cannot be considered solely the prerogative of the developed world, and it is critical that the recently created momentum not be lost. Studies clearly indicate that the economic gains of avoided health impacts far outweigh costs of implementing such programs. Moving forward, an urgent consensus is required between all stakeholders in overcoming the technical and financial implementation hurdles ahead. Simultaneously, efforts must strengthen mechanisms for phasing out existing polluting fleets from Indian roads. 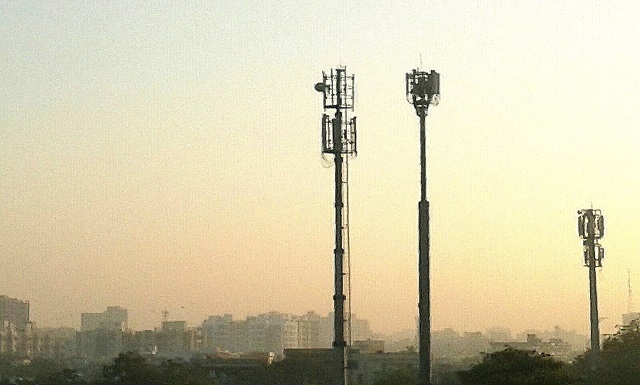 Has India Improved Energy Efficiency?